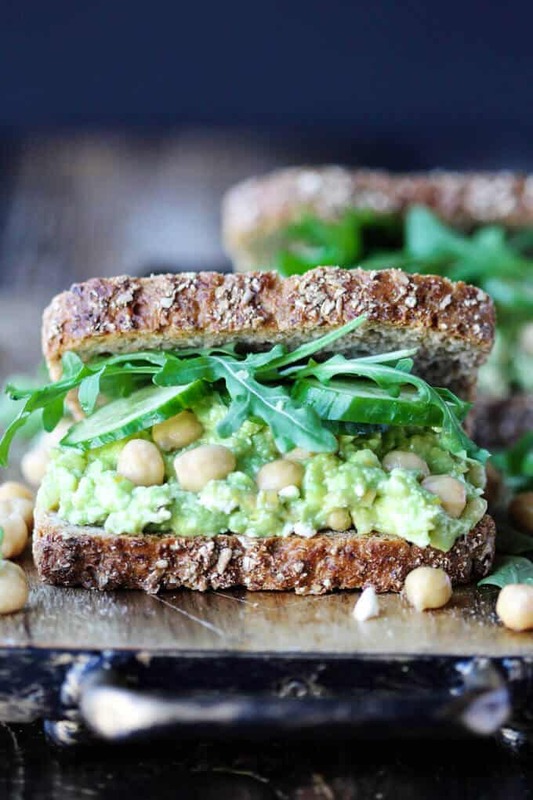 This Smashed Chickpea Avocado Feta Sandwich is a super healthy and super easy lunch option to prepare on the fly. It can be prepared in less then 10 minutes and tastes out of this world delicious. Whenever I feel sluggish and heavy I like to come up with light and healthy options to eat during the day. I recently felt this need; especially in the wake of Super Bowl. And so it was that this Smashed Chickpea Avocado Feta Sandwich was born. Previously when I was working a corporate job, I would often take in some chickpeas in a tupper wear and a whole avocado for lunch. Then for lunch, I would just slice up the avocado into my chickpeas and add some olive oil (which I always had). Another workplace staple was lemon. I always had fresh lemons in the community fridge. For some reason people thought this was weird. But I love my salads with lemon and olive oil. 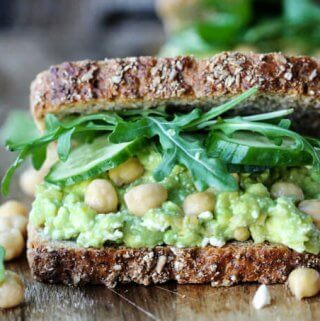 It was so easy to just have it there and bring salad or chickpeas and avocado and just top it with some squeezed lemon and some drizzled olive oil. Voila you have a healthy lunch right there. 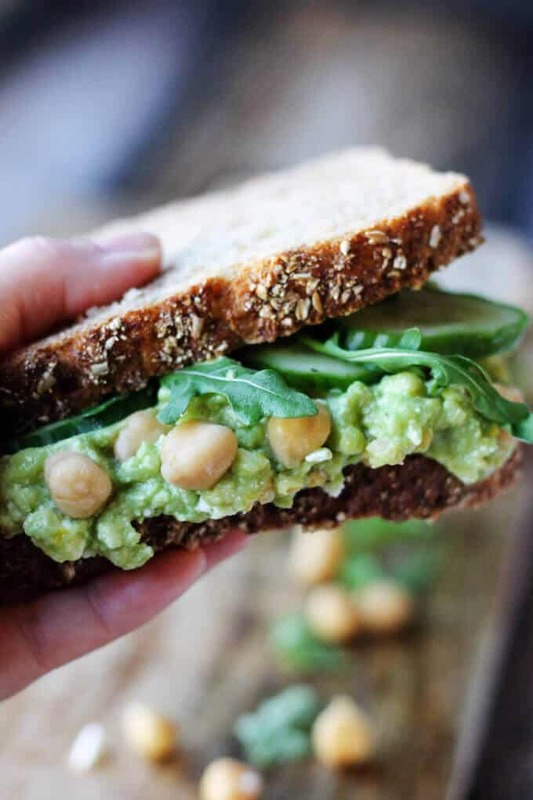 But I took this Smashed Chickpea Avocado Sandwich to another level. I added FETA cheese! For those of you who regularly follow this blog, you’re aware that I can’t even express how much I love feta cheese. I can eat it all the time! I’ve paired avocado with feta before and it was a huge hit. If you’re interested you can check my Guacamole with Feta recipe, or this Smashed Avocado Poached Egg Toast. I think this post combines two of my favorite pairings together: avocado +feta and avocado + chickpeas. For an extra freshness I added sliced cucumber and for a little punch – …a peppery arugula. I served it on the multigrain bread and, as this post suggest, it came out delicious. Horiatiki Salad with Golden Greek Pepperonicini. 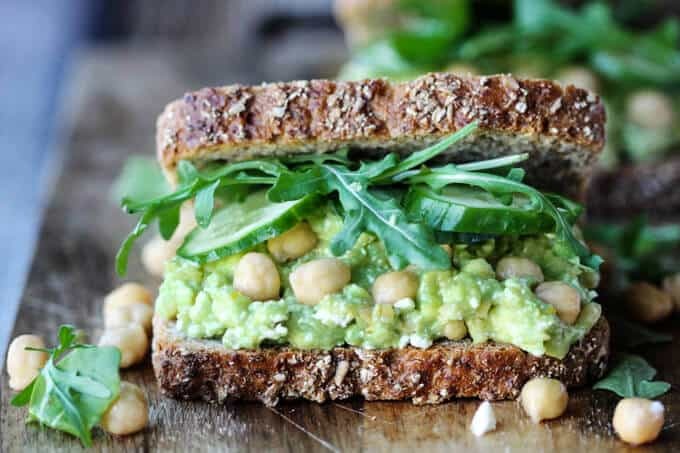 I hope you enjoy this recipe for Smashed Chickpea Avocado Feta Sandwich and use it whenever you’re in need of a quick and healthy lunch. Place the mixture on a slice of bread, top it with cucumber, arugula and the second piece of bread. Enjoy. This sandwich has so many of my favorite foods and flavors in one! I love it! This would be such a great sandwich to make for quick lunches when I work from home. I really like all the textures you have going on in this sandwich! Avocado and feta are a great combo, too! That looks so delicious! I am always looking for a lighter lunch and I’m crazy about chickpeas! This looks like a great vegetarian lunch. I love avocado and chickpeas. 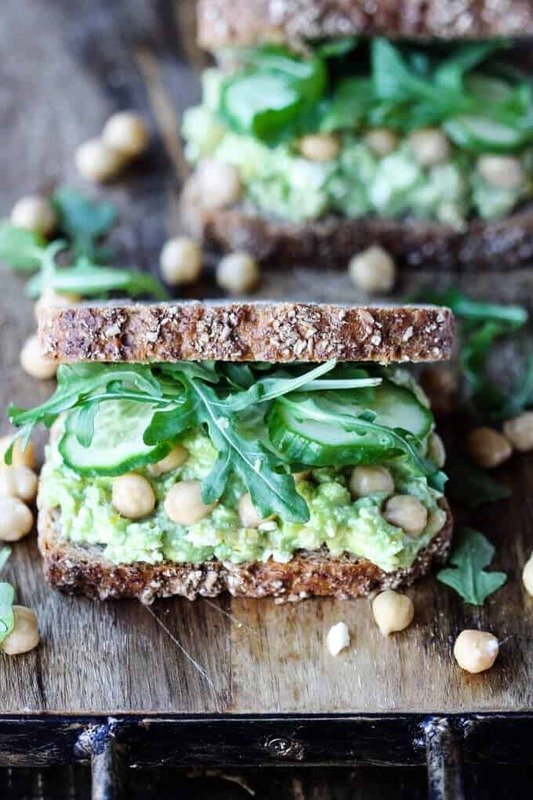 One of the best looking chickpea sandwiches I have seen do far!! !